Kicking off with "Living in the past" I was impressed by the sound - it was the clearest sound I'd heard all weekend. Either the prog stage had better sound than the other two stages all weekend or they'd got it right for Jethro Tull, but either way this was great news. 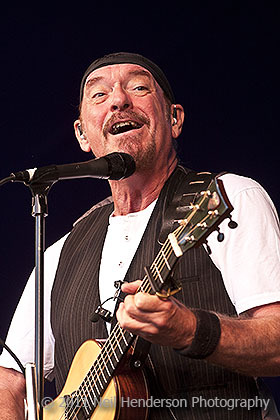 "Living in the past" is one of the few Jethro Tull songs I know so this was a great start to the set for me. The second track was another popular track - "Thick as a brick", and it was clear that many of the crowd knew all the words to it. Jethro Tull have a huge amount of material to choose from with numerous albums spanning a career dating back over 40 years. Tonight we get several songs from the early 1970s - Living in the past, Thick as a brick, Hymn 43, Aqualung, Locomotive Breath and Bouree - over half the set in fact. For the encore, Jethro Tull were joined by Joe Bonamassa for Locomotive Breath. 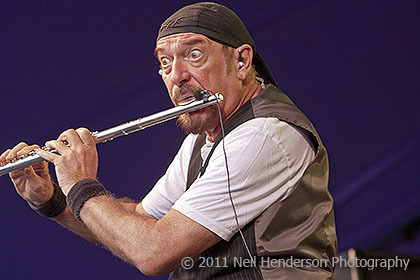 Like many of the bands this weekend Jethro Tull have the experience necessary to put on a great show, and they do. They put in an excellent performance and make it look easy.